This newsroom drama tells of the small group of comparitively low-status journalists who, alone, refused to swallow the official government-sanctioned version of events in the run up to America’s invasion of Iraq in 2003. Densely factual and sometimes a little unweildy, this is a film in which good intentions outweigh style and execution. Woody Harrelson fares best with the on-the-nose screenplay, bringing a muscular brio to the role of Jonathan Landay, one of four journalists affiliated with the news agency Knight Ridder who dared to ask the questions that the major new outlets failed to voice. 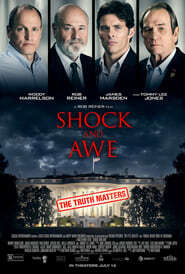 The presence of Harrelson and co-stars James Marsden and a typically abrasive Tommy Lee Jones will be a key additional selling point for a film which will likely be marketed on its thematic, if not stylistic, kinship with crusading journo pictures like All The President’s Men and Spotlight. However comparisons between this slightly muddled and overbearing movie and the classics of the genre are likely to underscore that this isn’t quite in the same league. Too prone to the use of heavy-handed clichés to register on the prestige awards circuit, this is a film which fails to capture the nervy energy of the news room and doesn’t offer the satisfaction of a detailed dissection of a first class piece of investigative journalism. As such, word of mouth is could be muted.